The Stanford’s Map of the environs of Paris is from a fascinating series of reproductions from our Edward Stanford Cartographic Collection archive. 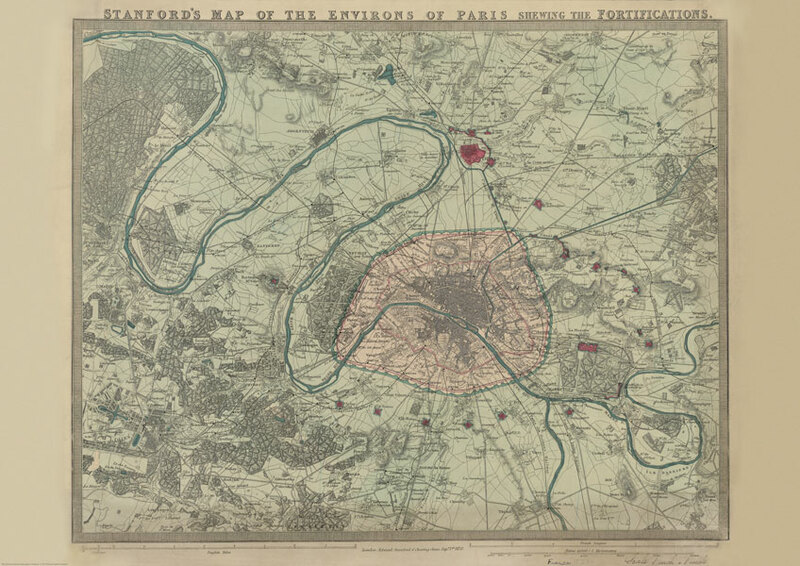 The text reads ‘Stanford’s map of the environs of Paris shewing the fortifications.’ It is dated September 1st 1870 (nineteen years before the Eiffel Tower was erected). 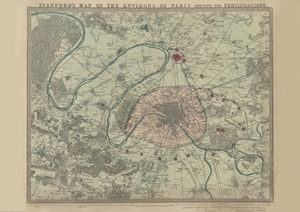 The map covers the centre of Paris (indicated in pink) and extends well outside the present day Boulevard Périphérique, the course of which is indicated on the map by the old city walls. Coverage of the north includes St Danis up to Montmorency. 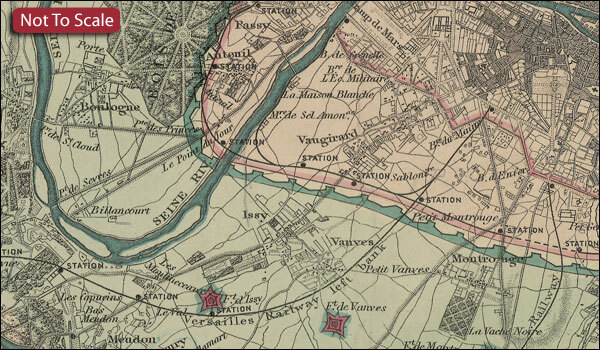 The East includes the Château de Vincennes, most of Champigny-sur-Marne to the north-eastern Bondy. Coverage of the south shows Villejuif down to Forêt Domaniale de Verrières. In the west the map takes us beyond the northward bend in the Seine to include all of the Bois de Boulogne, the Parc de St. Cloud all the way up to St-Germain-en-Laye. This reproduction has been taken from the original cartographic scale of [1:60,000] on an 18.5”x23” map. This is the A3 paper version. Various districts of the city, as well as surrounding villages are named. No street names are shown. The map has no legend but topographic artistry shows elevated areas and other details. This lovely map will appeal to anyone interested in this great city.